Hearts' focus remains on a top-half finish despite closing to with two points of second place with a 2-0 win over Ross County at Tynecastle. "At the start of the season the aim was top six," said boss Robbie Neilson. "People were talking about us challenging then you lose a few games and everyone's talking about can we get in the top six. "Now we have won two and people are asking if we can challenge again so we're not going to get carried away." 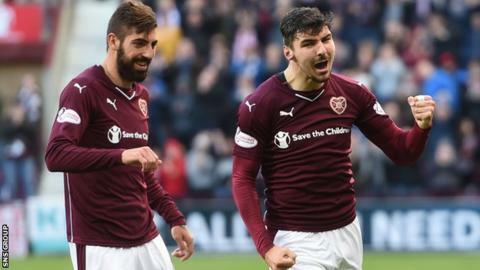 Goals from Callum Paterson and Osman Sow gave the home side maximum points against a lacklustre Ross County. Hearts rarely looked threatened despite playing most of the second half with 10 men following Blazej Augustyn's straight red card for denying Liam Boyce an obvious goalscoring opportunity. "We are a team that's been promoted from the Championship so if we can get higher than top six then great, but we have to earn results and keep working hard," added the head coach. Neilson and his players now turn their focus towards a midweek League Cup match against Celtic. But despite the pressure Ronny Deila's side have been under lately, the Hearts boss was playing down the possibility of their task being any easier than usual. "Celtic are the huge favourites coming here," added Neilson. "They have top class international players so we have to be on our game to get anything." Ross County had plenty of the ball, especially after Augustyn's dismissal, but failed to carve out many meaningful chances in front of goal. It was just a fourth Premiership defeat of the season for the Staggies and manager Jim McIntyre was disappointed with his side's performance. "The best team won," McIntyre told BBC Scotland. "Hearts won the individual battles, especially in the first half. "We've had a lot of plaudits lately and rightly so but today we were miles off it."